That snapping sensation or “crackling” sound that occurs in your shoulder when taking in an extra game of tennis or swimming a hard set of laps. That limited motion and numbness when you spend the weekend painting your house or chopping wood, followed by the inability to raise your arm much higher than waist level. If any of this sounds familiar, chances are you have injured your rotator cuff – that group of muscles and tendons that stabilize the shoulder joint, thereby allowing you to move your arms and rotate your shoulders. 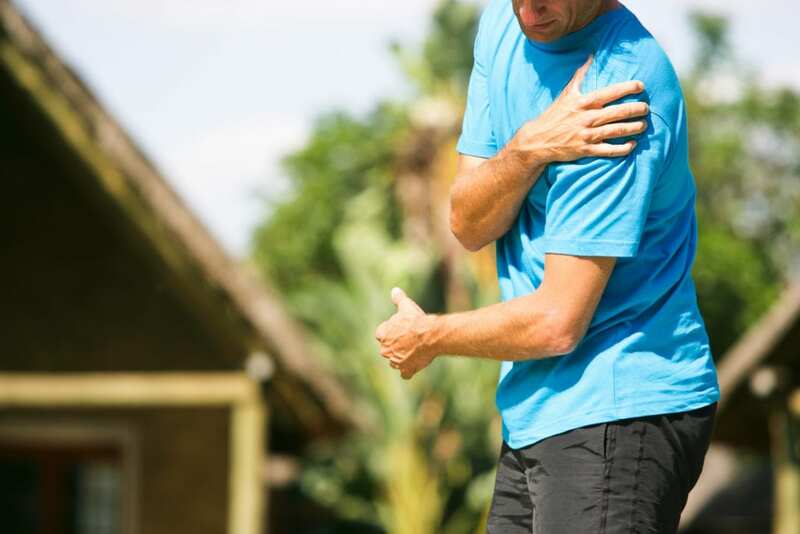 Rotator cuff injuries can range from inconvenient inflammation following a minor strain, to deep tears within the tendons or muscles. Whether sports-related or from overuse, rotator cuff tears are one of the most common orthopedic injuries. And for the more than 500,000 Americans per year who are diagnosed with a rotator cuff tear, surgery is the proper solution if physical therapy, cortisone injections, and anti-inflammatories don’t work. Your orthopedist will want a complete list of medications (and supplements) you are taking, including dosage and frequency. The doctor will probably tell you to stop taking any medications that are blood thinners or over-the-counter pain medications one to two weeks prior to the procedure. As much as you will want to do things for yourself, it’s unlikely you will be able to lift a finger, let alone move a shoulder. Enlisting the help of someone to help dress you, carry things, and drive you to places will lessen the strain on your healing shoulder. You will be hard-pressed to wear anything but loose-fitting, open-front, button-down or zippered shirts or jackets. Since you likely will be wearing a sling after the rotator cuff surgery, don’t expect to get any clothing over your head. You will be needing pillows to prop up your arm and keep it elevated, plus a surface near your bed for drinks, your remotes, and your cell phone charger. Now is the time to pamper yourself with new pillows and supports. Speak to your manager or your human resources representative to make sure your duties won’t interfere with your healing. Depending on your job, you may have to take on a different set of duties during your healing process. Also consider speaking with your occupational health specialist to help you evaluate your workspace upon your return. Consider prepping meals ahead of time, and asking for medicine bottles that are easy to open. If you must have childproof bottles, ask your helper to help you sort out your medications ahead of time so they’re ready for you and within your reach – but not within reach of tiny hands. Before you are unable to make the rounds, arrange for your follow-on visits with your orthopedist, and meet with your physical therapist. Some physical therapists are co-located in your orthopedist’s office or in the same building; others may have early morning or late afternoon hours that work well with your schedule. At Personalized Orthopedics of the Palm Beaches, we want to make sure that each of our patients is well prepared for undergoing surgery. Knowing what to expect before, during, and after the procedure can make recovery easier and can eliminate questions, concerns, and complications. Our staff is equipped with a wealth of knowledge and experience in general orthopedics, sports medicine, total joint replacements, and more. If you are suffering from rotator cuff pain or any orthopedic (musculoskeletal) issue, Personalized Orthopedics offers you many on-site services for your convenience – including physical therapy. Call Personalized Orthopedics of the Palm Beaches today at (561) 733-5888 to schedule an appointment, or complete our easy-to-use online appointment request form now. Let us help you get back to feeling like new again!